Apps 'n Things Archives / Because...Interwebs! 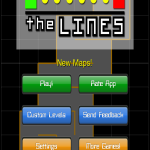 We released a new mobile app today, Between the Lines! 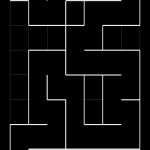 In this game you navigate a maze and try to complete it before the timer runs out. There are levels of all different sizes and we’ll be adding new ones, which the paid version will automatically download. There are four modes: “Normal” mode where you unlock levels as you progress. “Survival” mode is unlocked once you complete a map in Normal mode and you see how many maps you can complete before the clock beats you. Free-play lets you play levels in any order you wish as many times as you want. “Challenge” mode lets you try to beat your best time on any map. 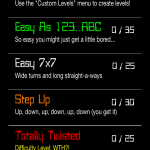 You can also create your own custom levels and customize the color theme. Currently only available for Android with the iOS version on the way. You’ve been warned…it’s a little addicting! We recently published a new mobile app called Dot-A-Palooza. It’s a simple but fun game with different levels of difficulty. In essence, you have to tap on dots that randomly appear on the screen before they fade away. There are bonus levels for extra points where a fading dot will not end the game (so you can choose to rest if you want) and as you progress through the game the dots get smaller in size, multiply in number, fade out faster….even start shrinking as they fade. With levels from Easy to Insane it’s sure to provide hours of fun for all ages!